I’ve made it no secret that I believe agents should invest in a more comprehensive Web presence than the template-driven banality provided by their franchise. Notice I said “invest in,” not buy. Tremendous difference. However, I understand that not many agents are ready to push $5,000 or more into a customized site. I get it. But I can still argue all day about why one should. And I will, using WebsiteBox as my platform. I like Placester. I think it’s a good tool for building a solid, compelling website. Plus, it’s highly affordable. At $99, so is WebsiteBox. Placester connects to your local MLS easily, and WebsiteBox just announced data relationships with 300 MLSs here and in Canada. But what Placester doesn’t do is try to be your CRM (customer relationship manager). Because you shouldn’t buy a CRM for $10 per month. Nor should you buy one for $99, which is what WebsiteBox also offers. WebsiteBox’s building tools are very robust, and if you can manage to grimace your way through the very Windows 95 (maybe XP?) 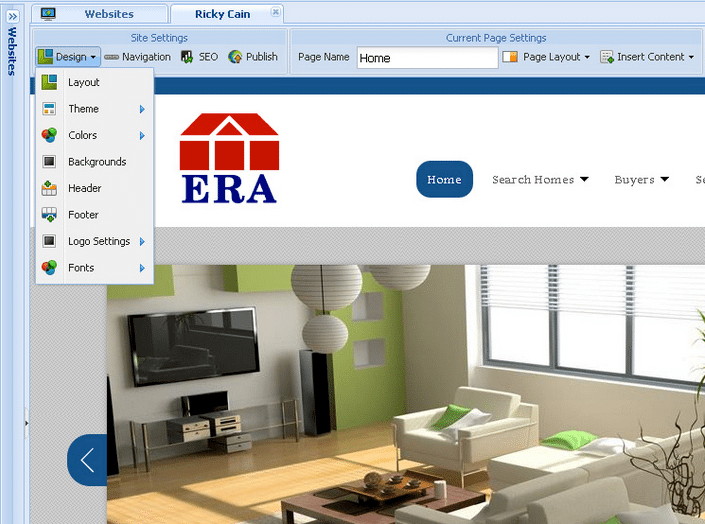 interface, I have no doubt an agent can build a functional, good-looking website. You can alter layouts easily with simple drop-down menus, add front-page banner sliders, embed Vimeo videos and adjust color schemes. WebsiteBox makes site customization very easy. 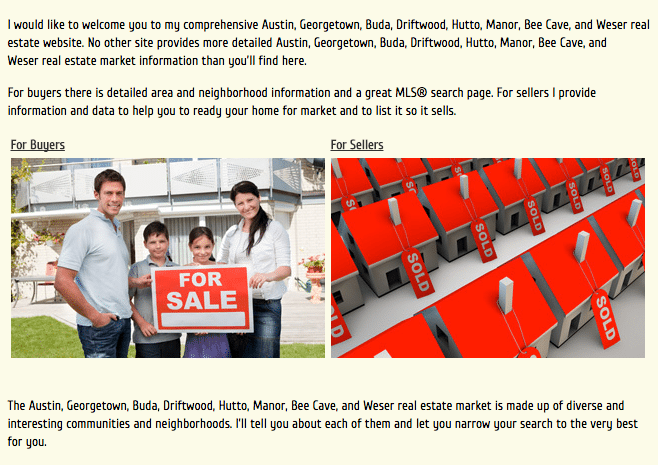 I would caution agent-designers to not overdo your site with visual clutter. Technology can often give us too much power over something. That’s what’s happening here. I would be higher on WebsiteBox if its design tools (its base templates are fine, if not ordinary) limited users to only fonts that would look good in specific templates, or required the use of only a select number of color combinations. Your options for both are many. The visual ergonomics of a website are absolutely crucial to its usability and purpose. Apps and mobile device usage continue to push the demand for carefully designed interfaces; everything from finger reach to how we hold a device is factored into information design. A good real estate website is about so much more than connecting to an IDX (Internet data exchange). Still, there’s nothing to say an agent can’t hand over their WebsiteBox account to an experienced designer. Maybe for another $2,000 you can have the best-looking WebsiteBox website out there. I also strongly suggest hiring a copywriter. WebsiteBox’s included content — which you can edit — offers a Web copy tactic that is dangerously close to keyword-stuffing. In one sample, it repeats the regional markets in which the agent sells several times within a couple of paragraphs. This all but ignores the 2011 Google algorithm update Panda, which stressed ranking sites with high-quality expert content, de-emphasizing keywords. Using some highly specific, repetitive phrases that combine “real estate” and “your market” do nothing for SEO (search engine optimization), and even less for your reader. Yes, Google knows good writing from bland, mass-produced copy. Write original, brand-building copy. WebsiteBox does offer more than a website builder. Once in your account’s Control Panel, you can navigate very much like you would in Windows Explorer. Everything is easy to get to, but square and clinical. 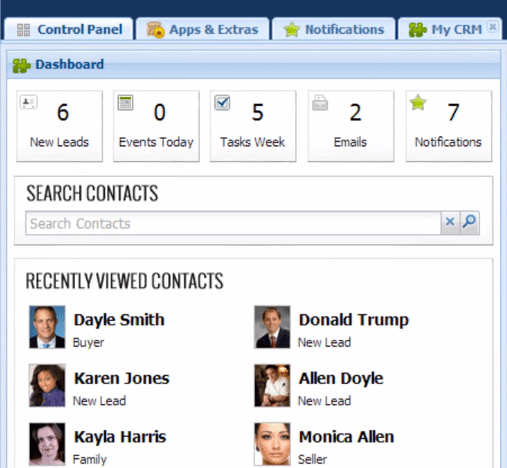 This is where you can access the CRM Dashboard that helps you manage contacts, emails, tasks, documents and a calendar. But, is that really a customer relationship management tool? Can I be given automated alerts about when to follow up? How about the quality of the website leads; is there a way to measure that? Can I build transaction-specific email templates? Are my leads tracked on social media? I’d also be worried about CRM data relative to my website being hacked, which happens even to the largest, most well-protected sites. My biggest issues with CRMs is when they try to do too much. I shouldn’t have the same problem with my website content management software. WebsiteBox also upsells annual Premium Phone Support packages for $99. A basic website builder shouldn’t require the level of phone support that would justify the expense. But a CRM might. There are some features I like about WebsiteBox, such as its agent roster pages. These are available to those with Team and Office accounts, not single agent sites. These can be used as landing pages on listing ads and help communicate brand. Its team interaction tools within its back end are useful as well. Agents can discuss site changes, monitor who changed what, and tell each other to update their listings. I think there are better options out there than WebsiteBox. It works for a lot of agents, and its model is proven. I really think it’s trying too hard, and ignoring the value of carefully processed, user-tested website design, as well as what it takes to actually program for a true SEO strategy. A widget won’t cut it. I get it, though; new agencies may need a site done quickly. WebsiteBox’s results look professional; it’s pretty easy and obviously affordable. Connect the IDX, upload some headshots and publish. That can work. Of course, you’re only a new agency for so long. Do you use WebsiteBox? What do you think? Leave a comment and let us know!